My company, slingboards Lab, aims to provide a platform to build slingboards. A slingboard is a visual tool that guides collaboration between teammates by using sticky notes. It brings sticky notes to smartphones, tablets and the web for empowering teams to better collaborate. A slingboard appeals to teammates who are dissatisfied with outcomes from shared accountability. It helps teams who need better results and want more commitment from teammates. It provides teams with visual aids that align individual responsibility with teamwork. A slingboard is a two-dimensional grid. The most important item in a slingboard is the columns because they are the ones that make it possible to visualize the workflow. 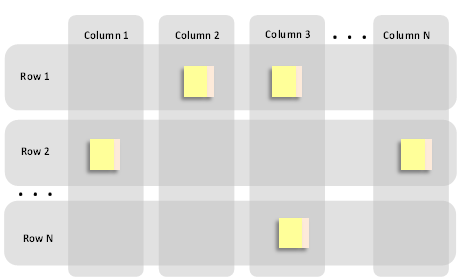 The aim is to move each sticky note from column to column to accomplish the workflow. The rows are used to group and organize the yellow stickies in a logical manner. If we expect to have only a few stickies then it is possible to have a single row without any grouping. Slingboard is great for teams that need to complete a business process. The picture above shows how to transform the workflow of a factory order into a slingboard. Each column represents a state in the workflow. A column expresses an explicit rule that transforms the collaborative work into a sequence of individual responsibility. An important feature that simplifies the board layout is visually pinning a status tag to the sticker. This status tag is used to visualize issue that is not directly associated with the value-added steps displayed by the columns. Pinning creates visibility and awareness and allows the right people to react quickly to that new status. A visual alternative to pinning is creating special columns that fulfill the same purpose. While this is valid, and many people do it, we prefer pinning to expose that something is going wrong, or not happening. Board real estate is expensive. If you start creating special columns for each status a sticky note can have, you might quickly fill the board with empty zones. It allows to see whether performance is met. Financial institutions: it can help tracking the investment process. Categories: Lean Startup | Tags: Pinning, Slingboard | Permalink.